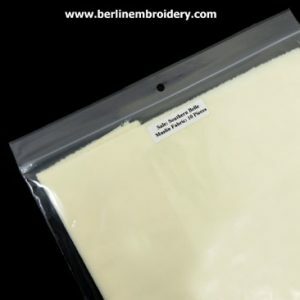 The Aida fabric is 100% cotton. I have 14 count and 16 count available. The threads of the fabric are easy to count as they are are all the same size making it easy to see the holes in the fabric.14 or 16 represents how many threads of fabric there are to the inch. 14 count fabric is easiest to see. 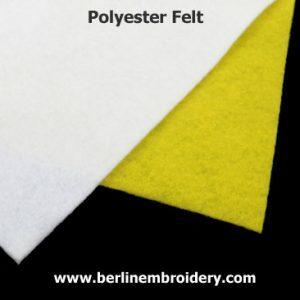 The fabric is durable, firm to the feel and handles taking out stitches well and can be washed once the embroidery is complete. 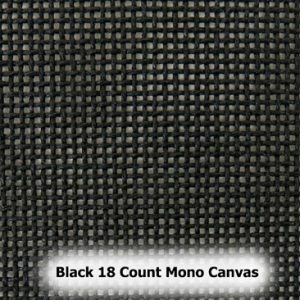 I have available some pieces of Zweigart 18 Count Mono Canvas (18 holes to the inch) which is the canvas that I use for my Hapsburg Lace Designs. 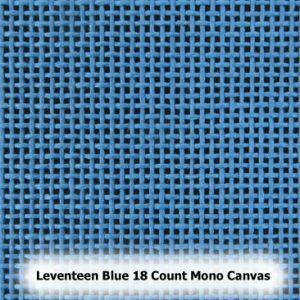 Currently I have Leventeen Blue, Black, Brown and Pewter canvas available in a variety of sizes. Cotton Organdie is 100% cotton and is 44 inches (110 cm) wide. 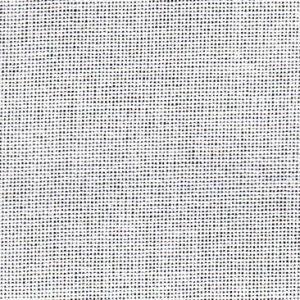 The fabric is slightly transparent yet firm, closely woven, does not fray easily and is most commonly used for Carrickmacross lace. 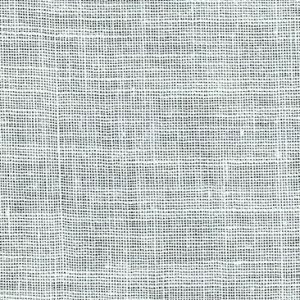 The Jacobean linen twill fabric is the traditional fabric used for Jacobean crewel embroidery and is woven in Scotland. 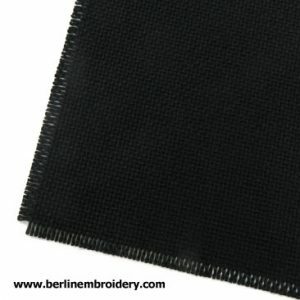 The fabric is stiff and heavy and can be used for embroidered tapestries, drapes, pictures, fire screens and cushions. 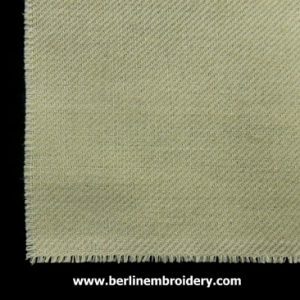 This traditional Jacobean Linen Twill fabric has the characteristic diagonal weave on both sides of the fabric. 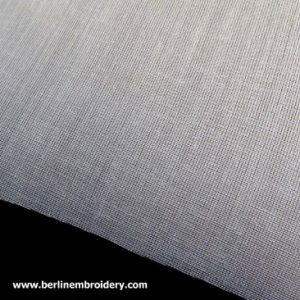 Belfast linen fabric has 32 threads to the inch and is 100% linen. The fabric measures 55 inches wide. 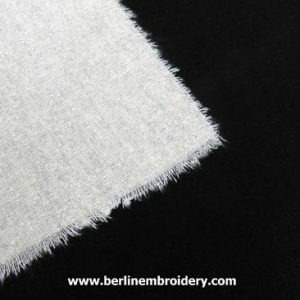 The fabric has a natural look as the threads of the fabric are not even. 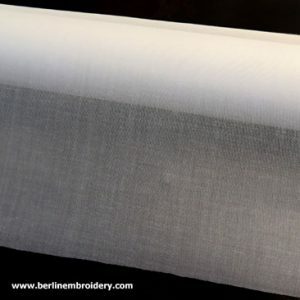 Experienced embroiderers love the look of linen fabric as it does not have the orderliness of even weave fabric giving the embroidery a romantic rustic look. 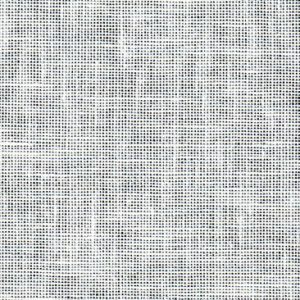 Cashel linen fabric has 28 threads of fabric to the inch and is 100% linen. 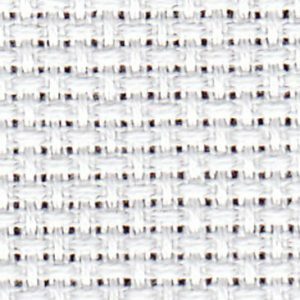 The fabric has a natural look as the threads of the fabric are not even. 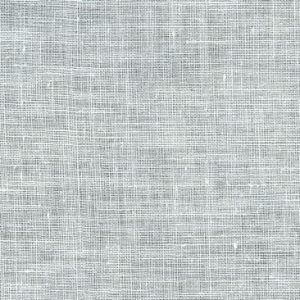 Lugana fabric is a blend of 52% cotton and 48% rayon. 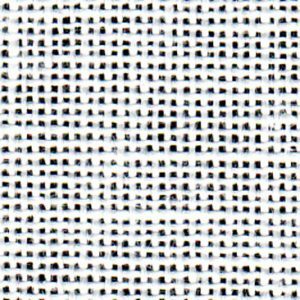 The fabric has even weave threads so that stitches/patterns will work out more regular than on an uneven weave such as linen fabric. 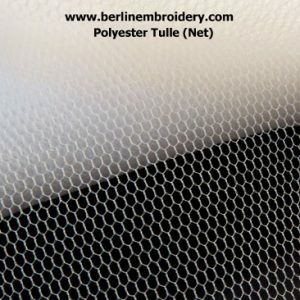 It has a nice smooth and firm surface so that when the embroidery is complete the viewer sees the embroidery and is not distracted by the fabric. I have a choice of 28 count antique white and 25 count black. 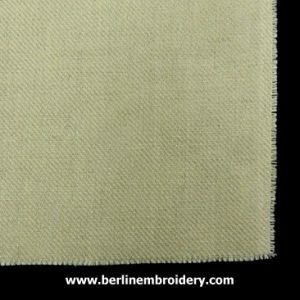 Mountmellick 100% cotton satin jean fabric is a tightly woven and a firm fabric traditionally used Mountmellick embroidery. 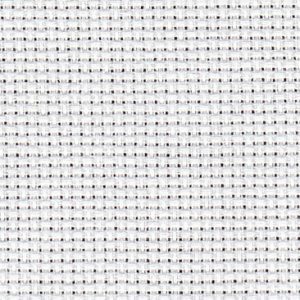 The fabric is white and has a nice smooth surface with a subtle sheen. 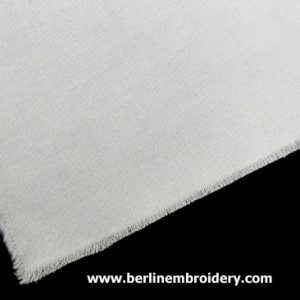 Mountmellick embroidery is an Irish form of white work embroidery in which floral designs are worked using white cotton threads in traditional surface embroidery stitches on the cotton satin jean fabric for table cloths, pillow cases and other household items. The embroideries in the pictures opposite are worked on the Mountmellick fabric. 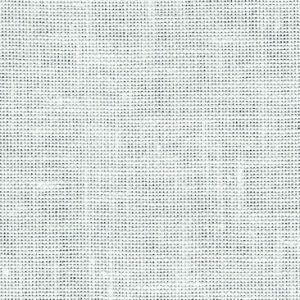 The Southern Belle muslin fabric (Calico in European terms) is a 100% cotton fabric and is light cream in colour. 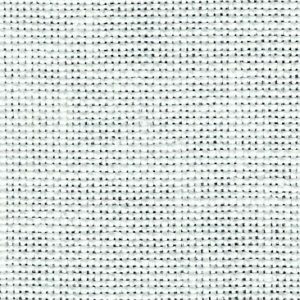 This wonderful fine quality muslin fabric has a 205 thread count (regular muslin fabric thread count starts at 70) and makes an ideal ground fabric for needle painting and other forms of free form embroidery. 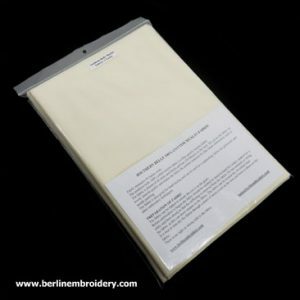 I use the southern belle fabric in my needle painting kits. 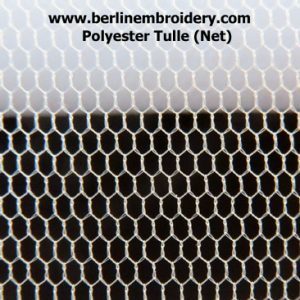 The Silk Noil is a natural silk that has a rough/bobbly surface and is good for goldwork embroidery and is available in off white and black. I recommend backing the silk fabric with Southern Belle Muslin fabric for added support. 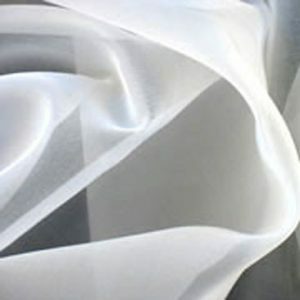 The silk organza fabric is a fine transparent fabric that is strong, non-stretchy, non-shiny and non-glossy unlike some organza fabrics. 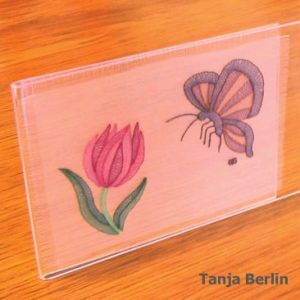 It makes a great fabric for shadow work embroidery as the embroidery becomes the feature and not the fabric. 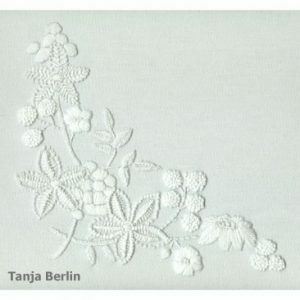 The embroideries in the pictures opposite are worked on silk organza fabric in herringbone stitch. 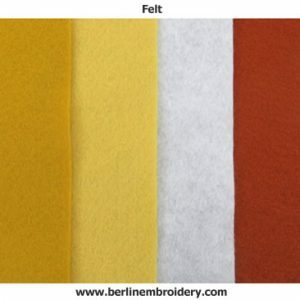 Felt makes an excellent padding material or foundation fabric for metal thread embroidery. 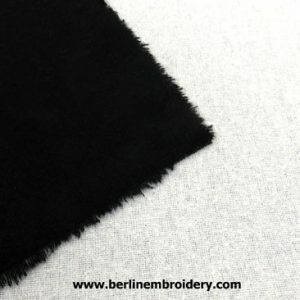 Elements of a design can be padded in layers of felt in a matching colour to the metal threads and then the metals thread are sewn over top. Mellow yellow is suitable for gilt threads and old gold is suitable for gold 2% and copper threads. The smooth kid leather has a metallic shiny surface accept the “Copper Head” which has a matte surface. 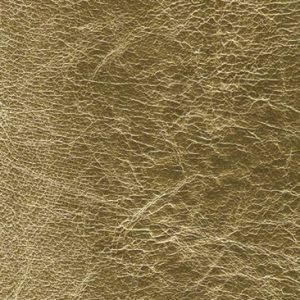 The kid leather is fairly stiff and is not appropriate for molding over very dimensional surfaces. 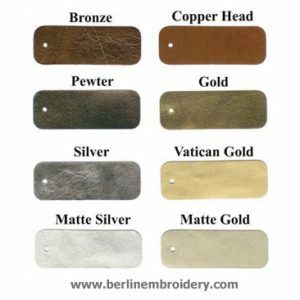 The wrinkled surface kid leathers come in gold, silver and pewter. They are slightly softer than the smooth surface leather and more mold-able.